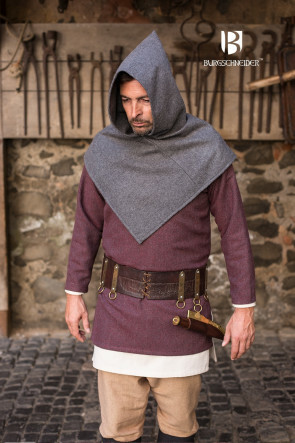 In general, the Middle Ages are divided into three epochs. 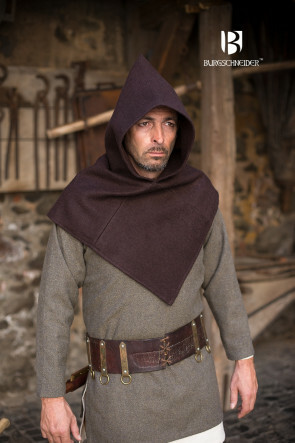 The Early Middle Ages span the 6th to the 11th centuries and are, as the name implies, the first of these three epochs. 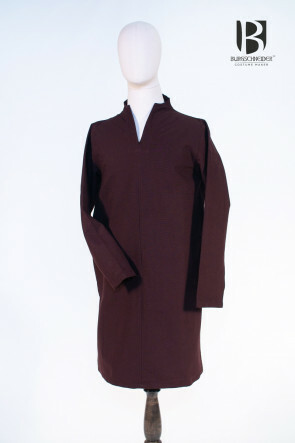 During this time, fashion played a societal role completely different from what we are used to today. 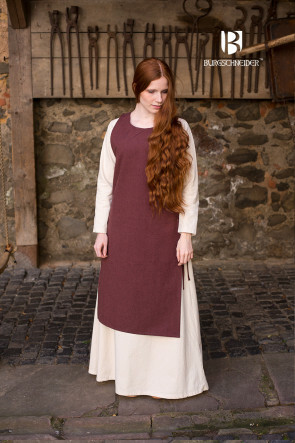 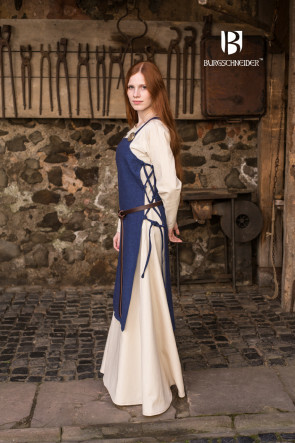 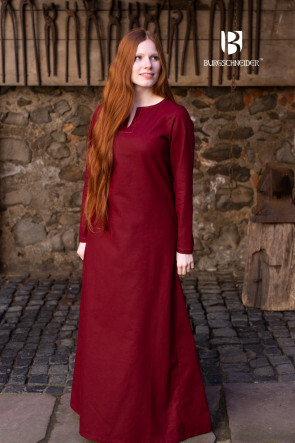 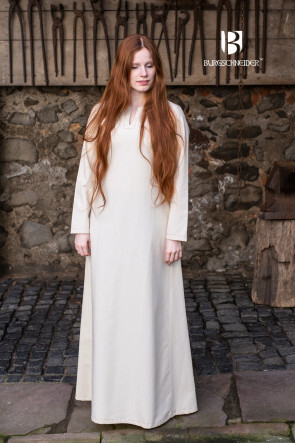 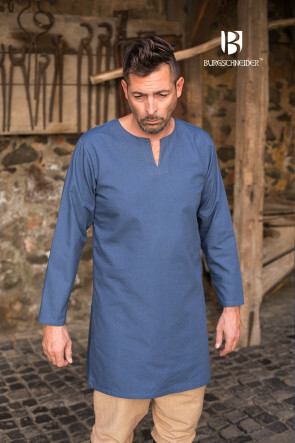 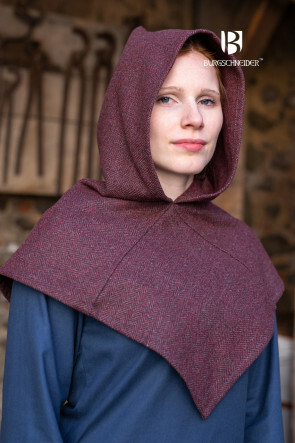 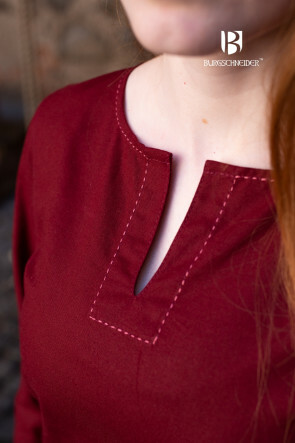 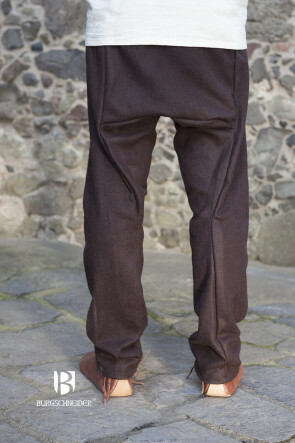 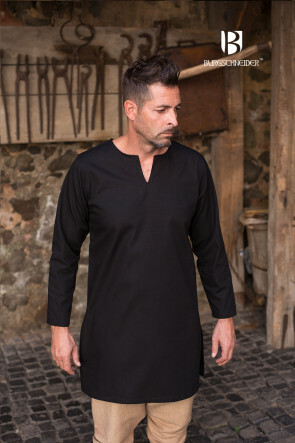 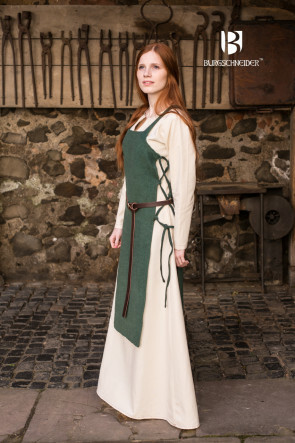 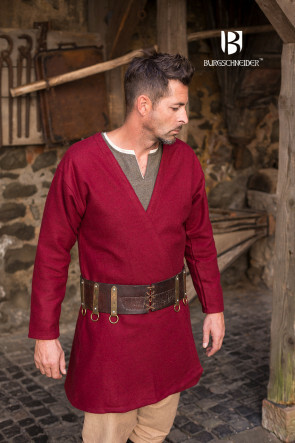 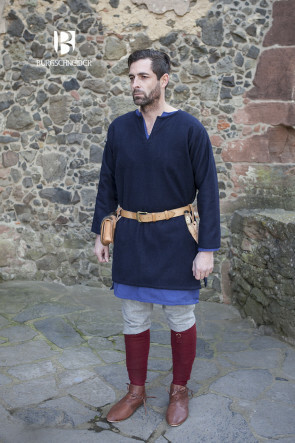 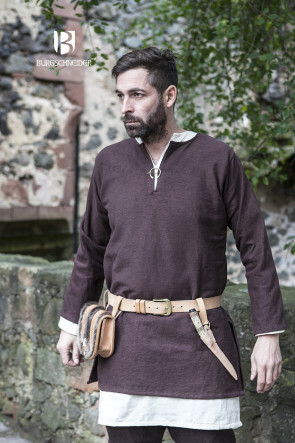 In the Early Middle Ages, clothing clearly depicted its wearer’s stratum. 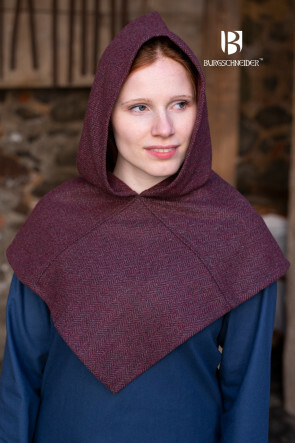 Strict laws codified which colors and items the lower strata were allowed to wear and which items were reserved for people with a higher station in life. 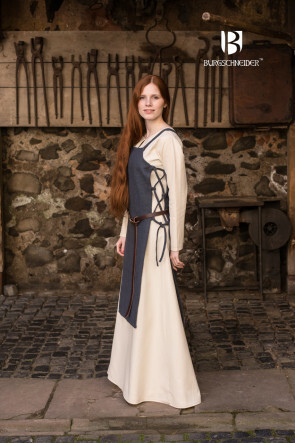 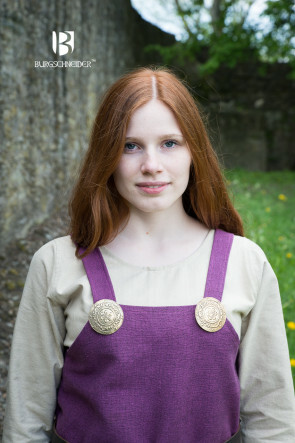 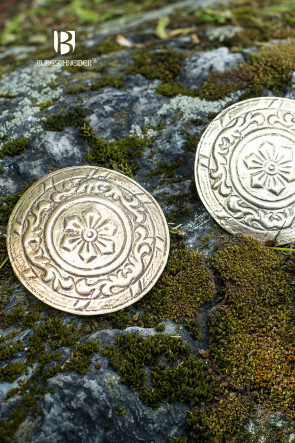 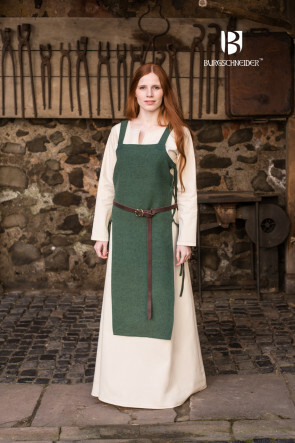 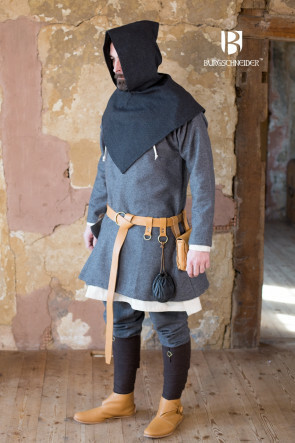 Since the nobility in the Early Middle Ages considered their clothing a symbol of their status, they made it a point to have their garments fashioned only from the most exquisite materials. 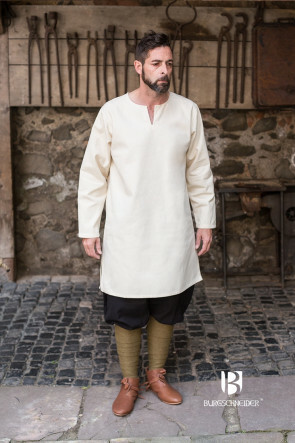 For instance, they preferred silk embroidered with golden or silver threads, so that everyone, at first glance, recognized that they stood before a member of the nobility. 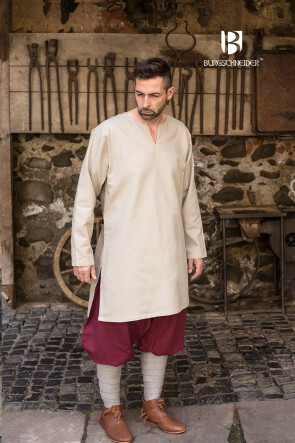 Furthermore, the nobility wore long robes and dresses, whose cuts required vast amounts of fabric—because the more fabric one could display, the richer one was deemed. 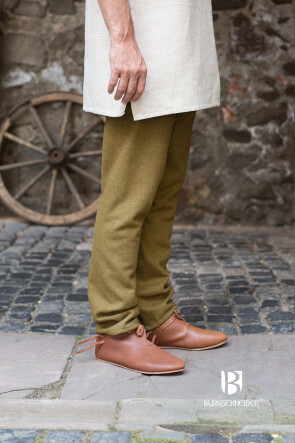 Those belonging to the lower strata couldn’t afford such luxury. 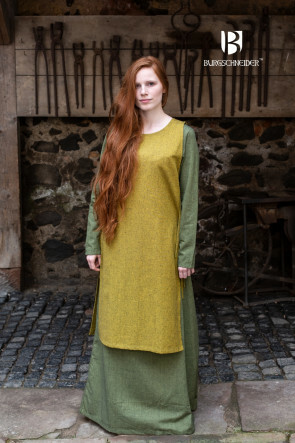 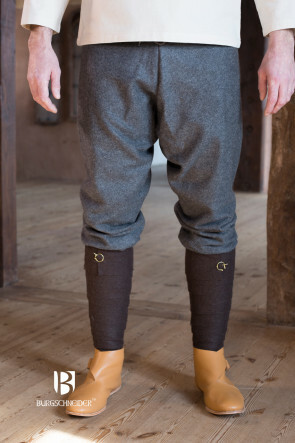 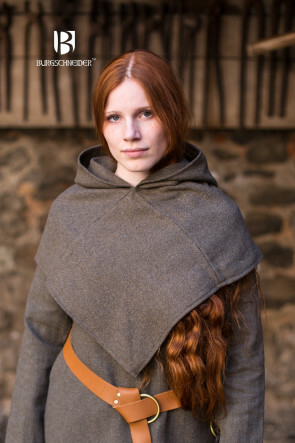 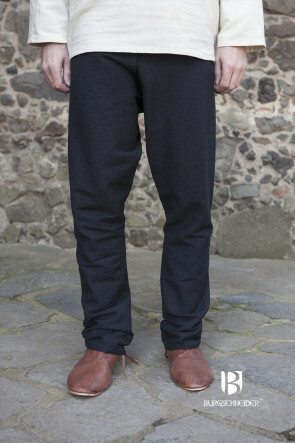 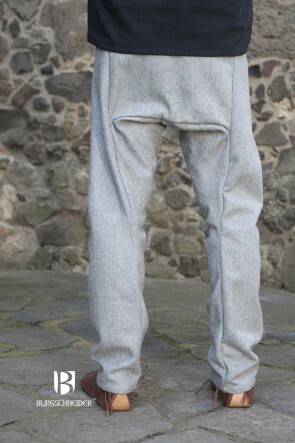 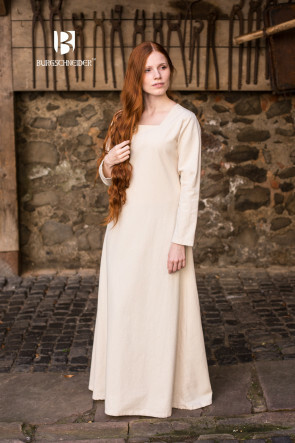 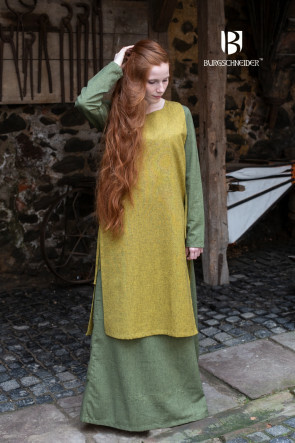 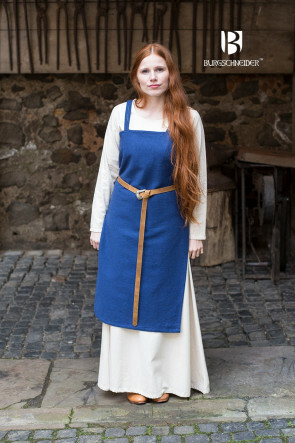 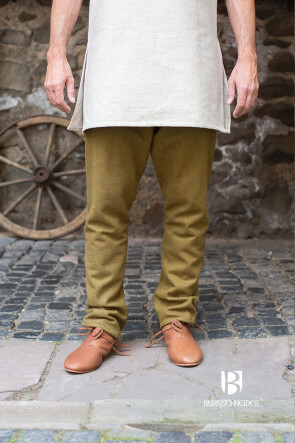 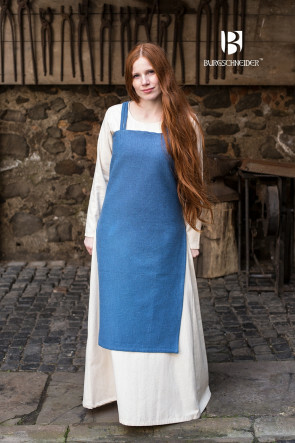 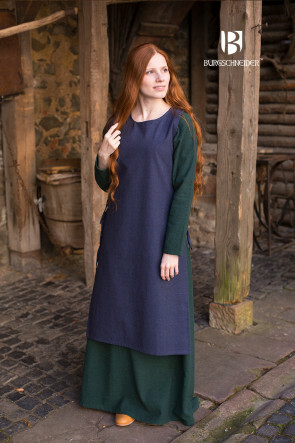 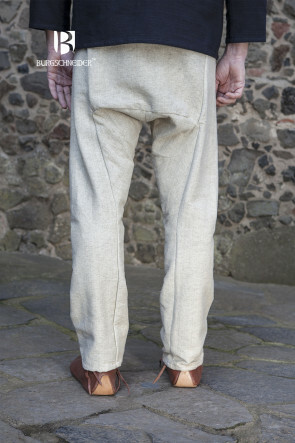 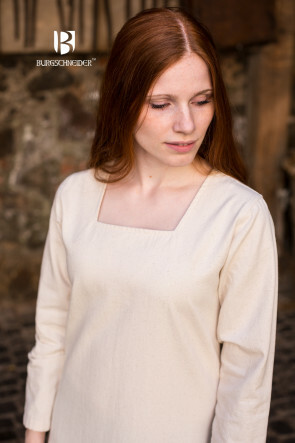 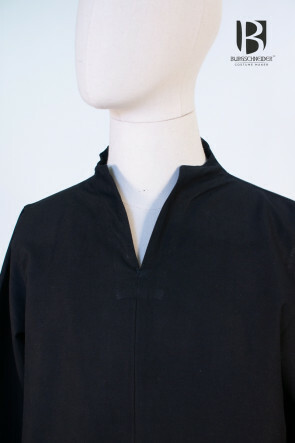 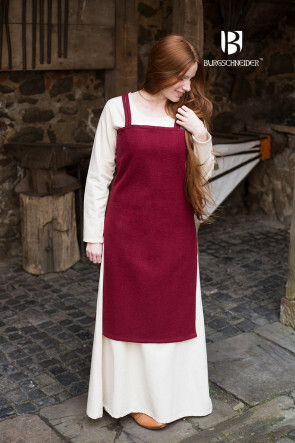 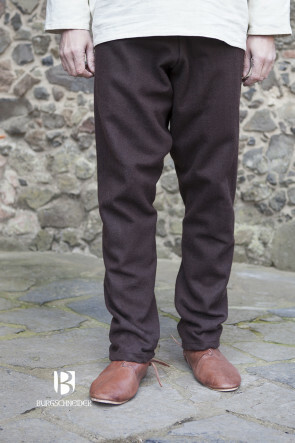 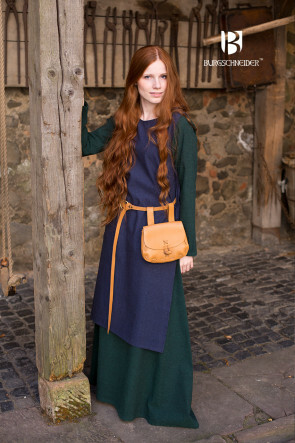 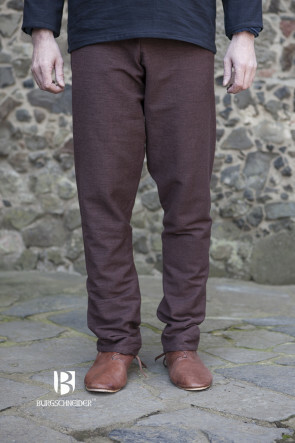 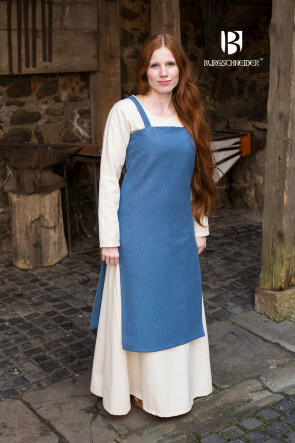 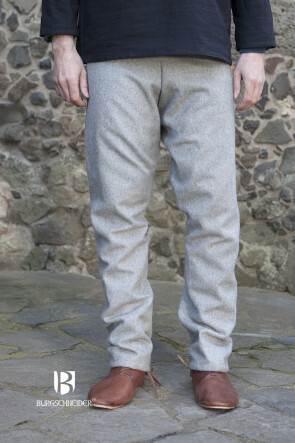 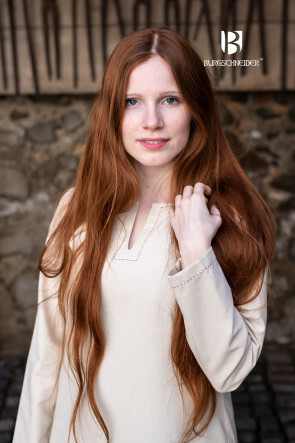 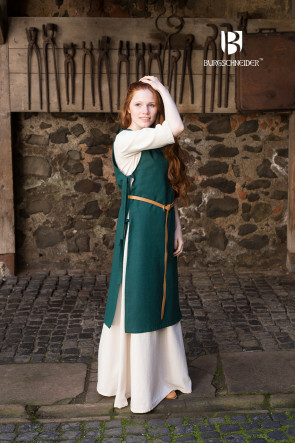 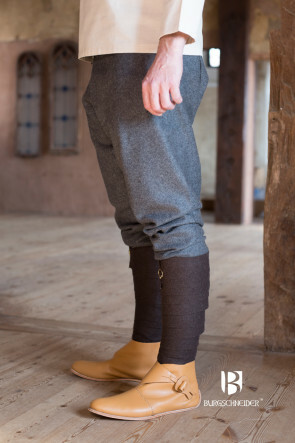 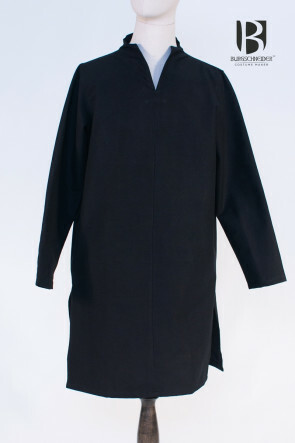 For their clothing, they used materials that were readily available and regionally grown—such as linen or wool. 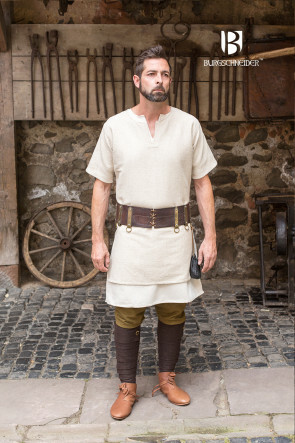 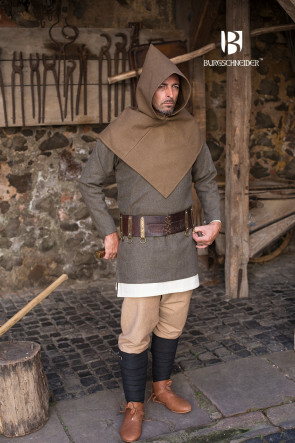 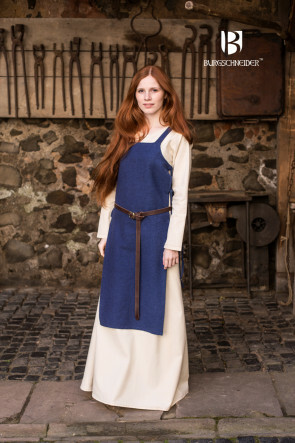 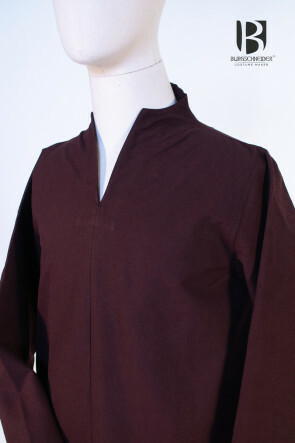 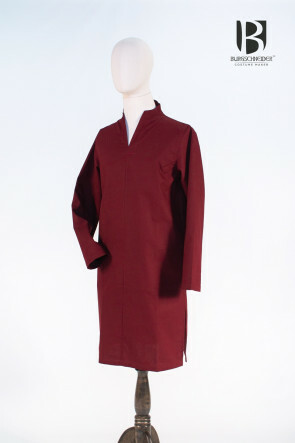 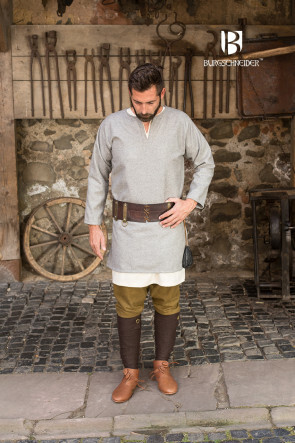 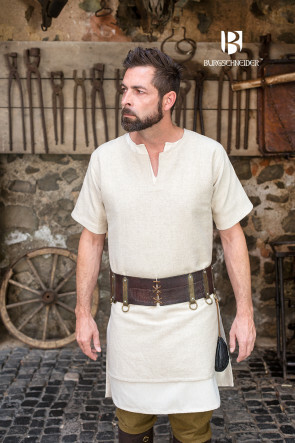 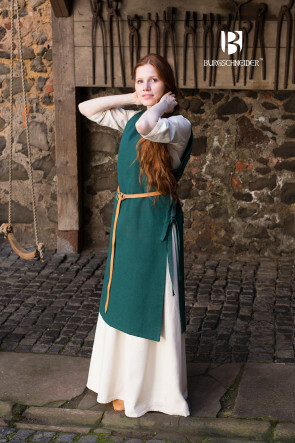 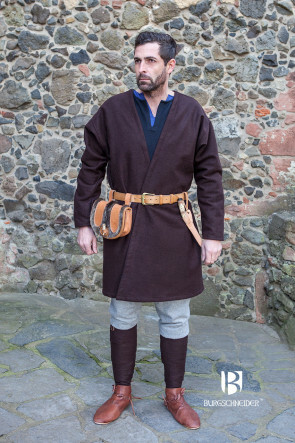 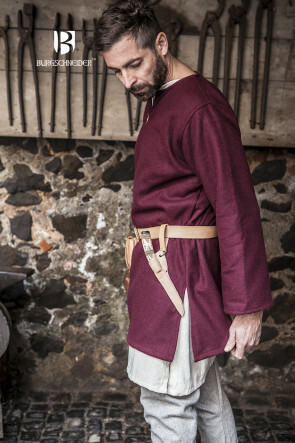 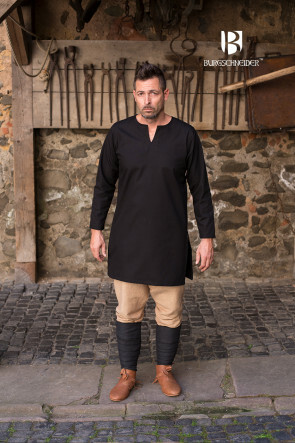 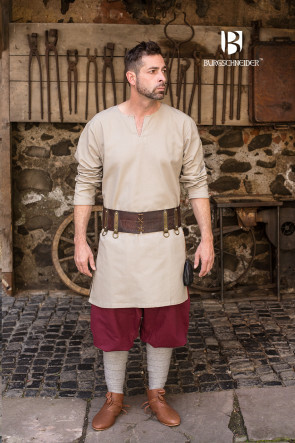 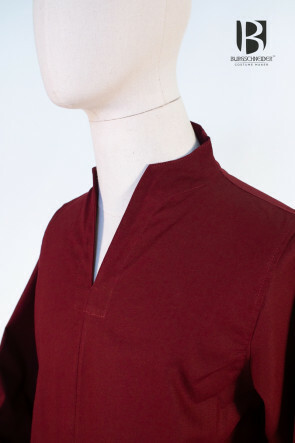 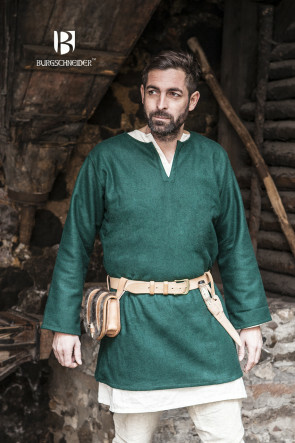 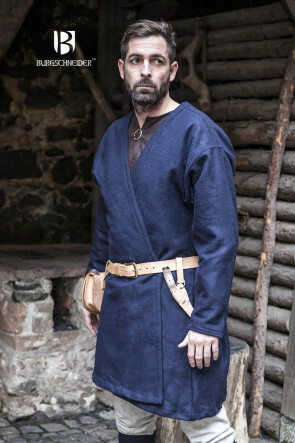 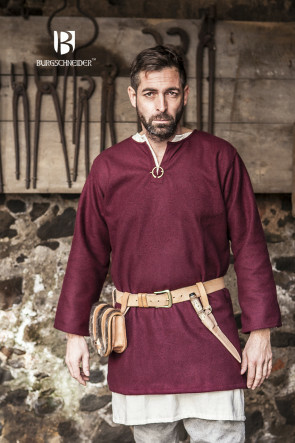 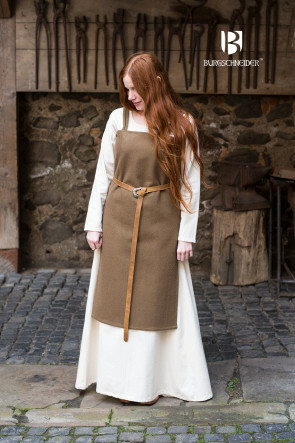 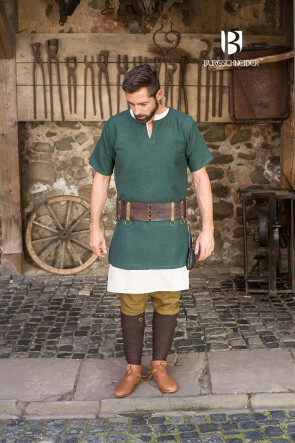 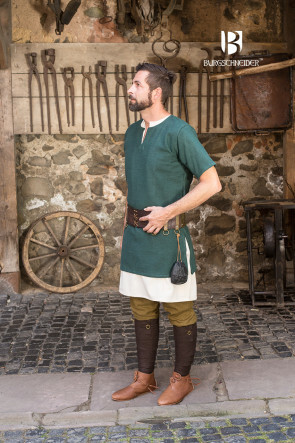 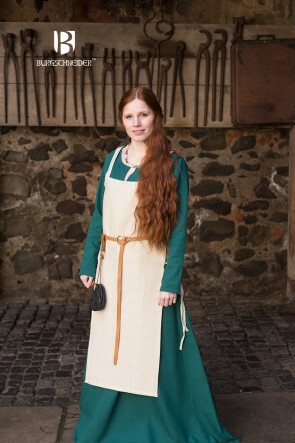 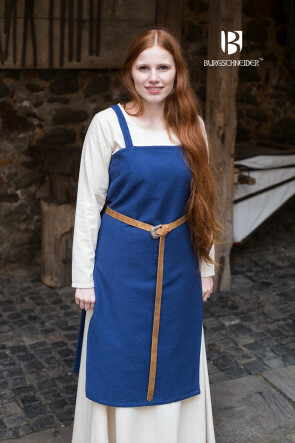 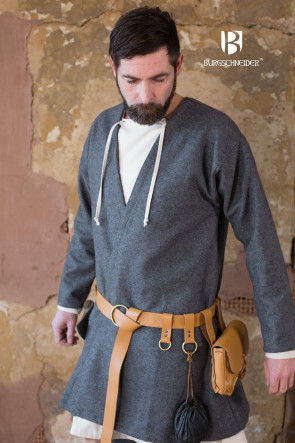 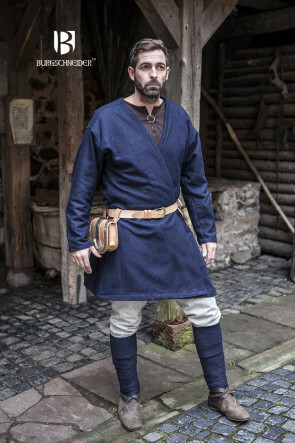 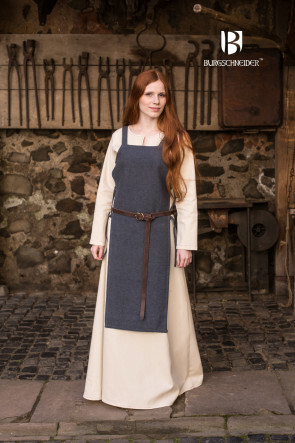 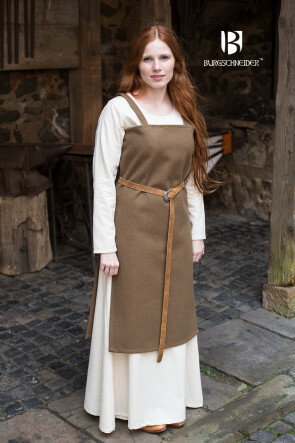 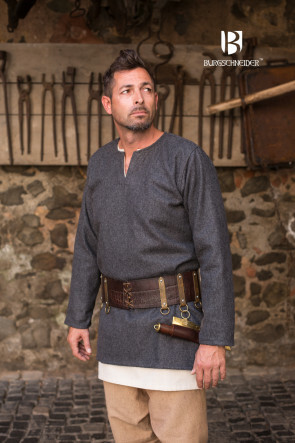 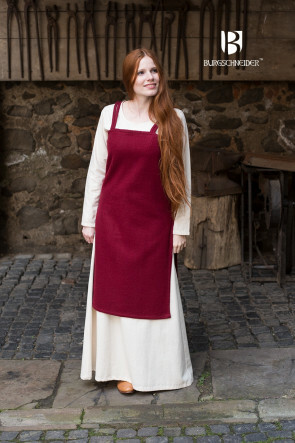 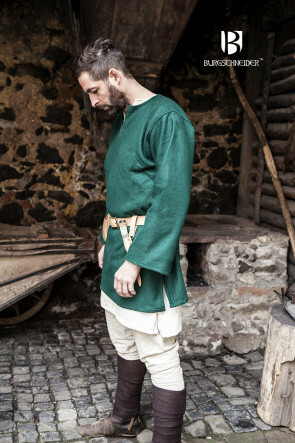 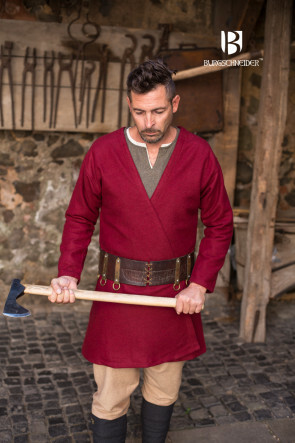 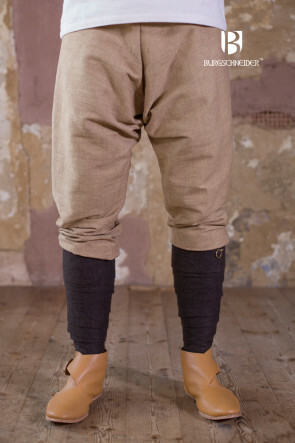 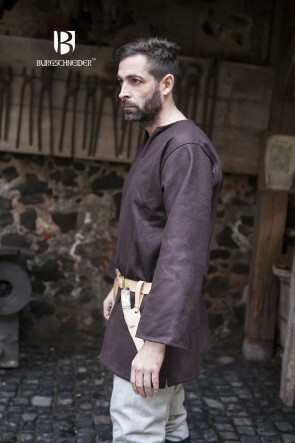 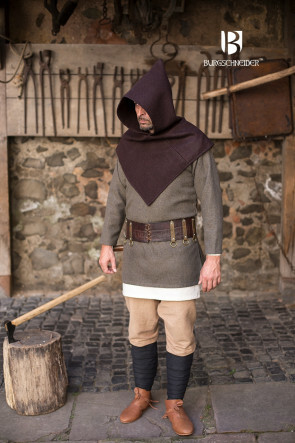 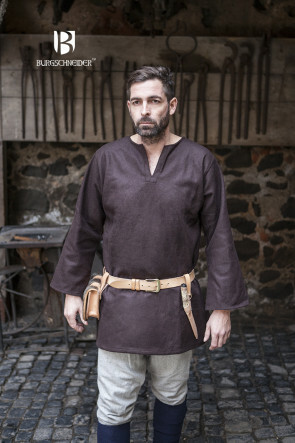 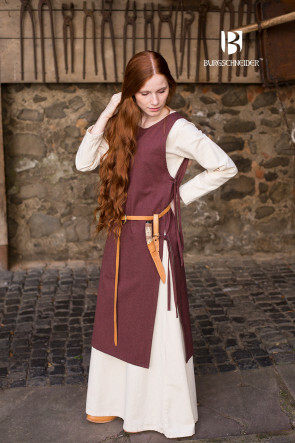 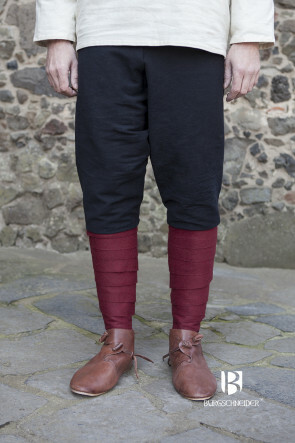 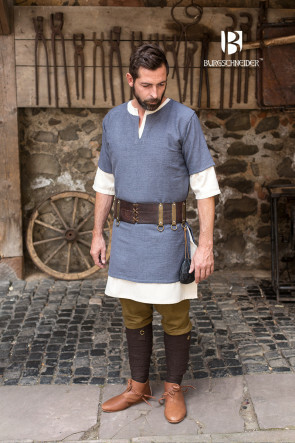 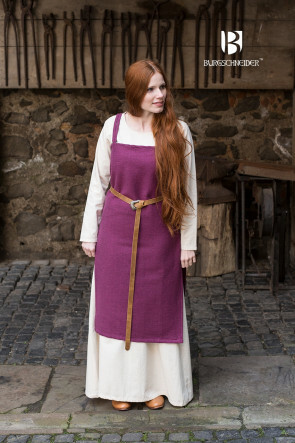 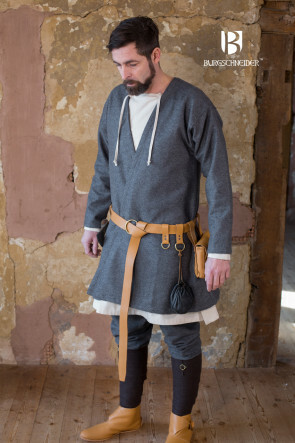 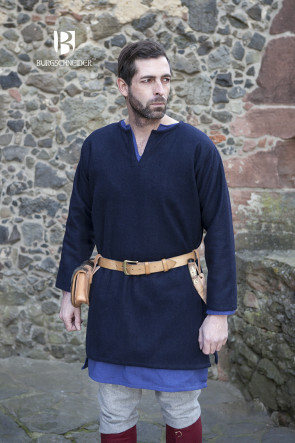 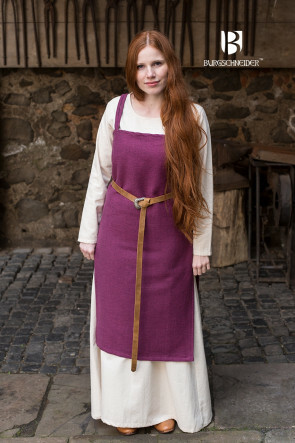 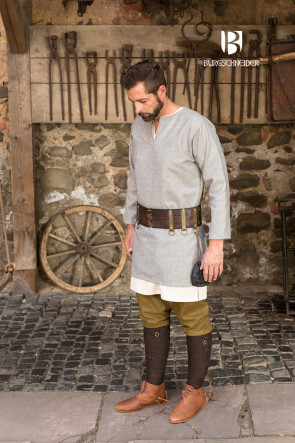 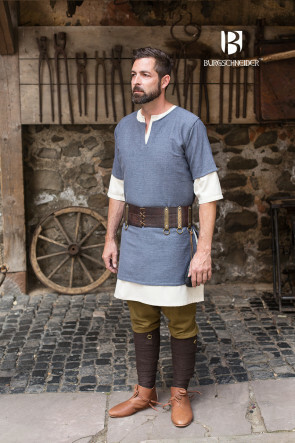 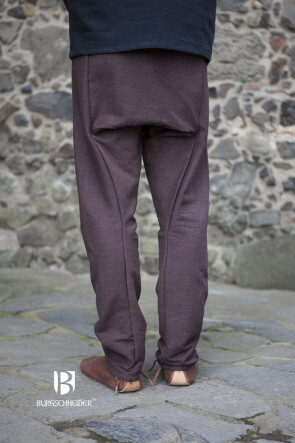 Their garments had to be suitable for hard labor, so cuts and looks needed to be comfortable and practical instead. 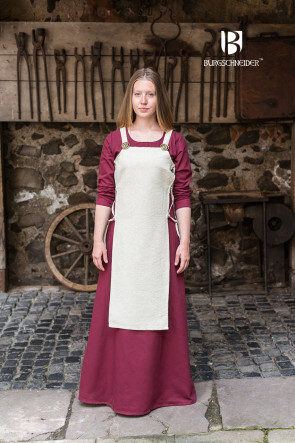 Researching clothing of the Early Middle Ages is accomplished mainly by examining archeological findings, e.g., by excavating graves. 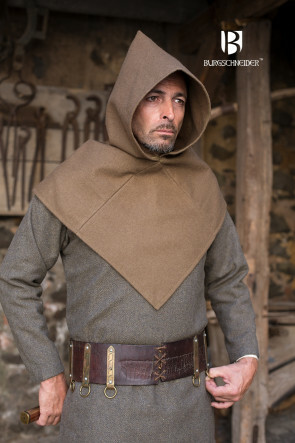 Because in the Early Middle Ages clothes were usually made from organic materials, most original exemplars have long since fallen prey to natural decomposition. 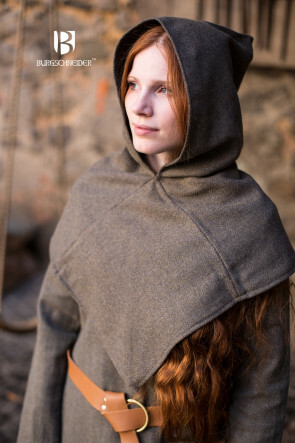 Therefore, only very few items from this era have been found so far. 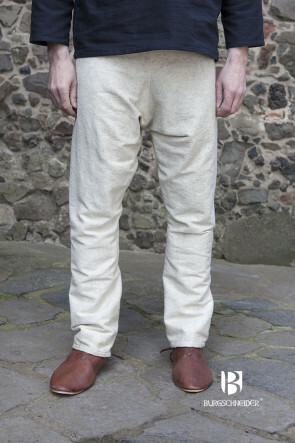 In 1907 one reconstructable textile vestige was descried in a bog in Bernuthsfeld and recovered from a man’s grave there. 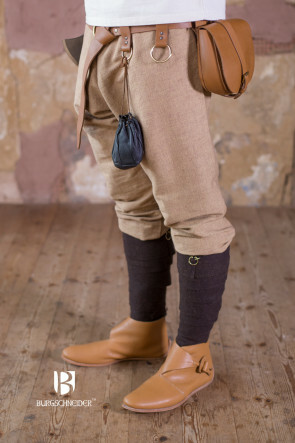 As it turns out, that was the only bog corpse that has ever been found so far, and his clothes were exceptionally well preserved. 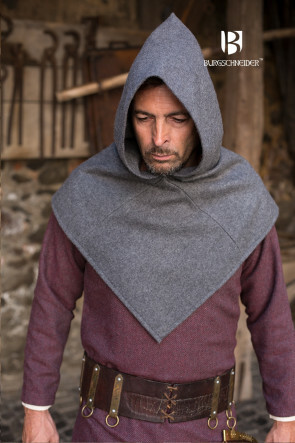 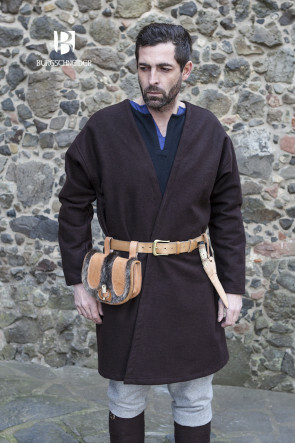 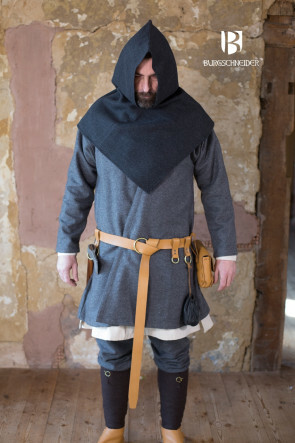 He was dressed in an outer garment, which was patched up extensively and made from all kinds of different materials, as well as a large, blanket-like cloak. 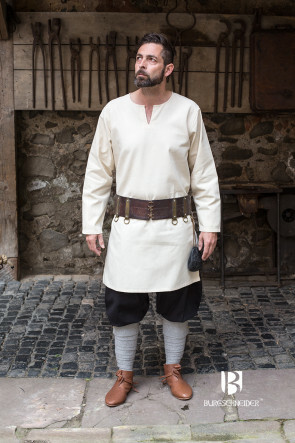 It is, however, fallacious to attempt to infer the wearer’s normal clothing from grave findings, for we cannot confirm whether these clothes were everyday garb or special burial garments.